We’d love your help. 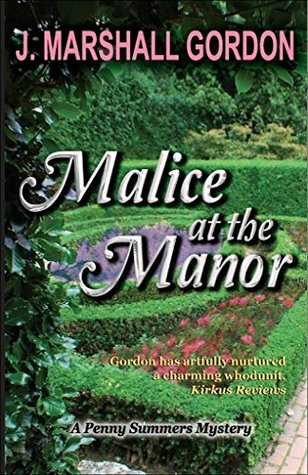 Let us know what’s wrong with this preview of Malice at the Manor by J Marshall Gordon. Penny Summers bones up on Renaissance garden design until she finds a dead docent and finds herself up to her tramp stamp unraveling a Civil War battle flag scam. In North Carolina where "The Recent Unpleasantness" between the North and the South is still romanticized, the problem of a dead docent in a famous garden leads ex-Navy public affairs officer Penny Summers to a C Penny Summers bones up on Renaissance garden design until she finds a dead docent and finds herself up to her tramp stamp unraveling a Civil War battle flag scam. To ask other readers questions about Malice at the Manor, please sign up. Penny Summers, a former Navy public affairs officer now out of the Navy and starting her own landscape design business, has traveled from Maryland to North Carolina with her friend and teacher, Madison Lerrimore. They're there to visit Brantleigh Manor, the (fictional) last garden designed by Frederick Law Olmsted before his death. A secondary goal is for Madison to meet and reconcile with her former stepfather, Wayland Morgan, who has become a Civil War enthusiast and reenactor, and who works a Penny Summers, a former Navy public affairs officer now out of the Navy and starting her own landscape design business, has traveled from Maryland to North Carolina with her friend and teacher, Madison Lerrimore. They're there to visit Brantleigh Manor, the (fictional) last garden designed by Frederick Law Olmsted before his death. A secondary goal is for Madison to meet and reconcile with her former stepfather, Wayland Morgan, who has become a Civil War enthusiast and reenactor, and who works as a docent, impersonating Olmsted, at Brantleigh Manor. They're staying with Penny's great-aunt, Zelma Porter. Penny doesn't really believe in her aunt's claimed psychic abilities, despite the fact that she (Penny) has her grandfather, Zelma's late brother, Jack, in her head making comments and suggestions. That sounds like a lot going on. It only scratches the surface. Madison's goal in meeting her former stepfather again isn't reconciliation. She's got a serious and legitimate grudge, regardless of what one thinks of her method of resolving it. Wayland also has acquired other enemies. as a result of his maybe not completely above board Civil War collectibles business. Oh, and an acquaintance from the years following his abrupt departure from Madison's life may also be a factor. And let's not forget Wayland's partners in crime. On top of all this, several of our major characters are having what might politely be called relationship issues. There's a lot going on here, interwoven in interesting ways. It's a solid, enjoyable mystery, even if I did roll my eyes at Marylanders being referred to as "Yankees." Sure, in a purely technical sense in the context of the War of Southern Treason, yes, okay. But seriously? No. Overall, even if that last paragraph is a bit cranky, I enjoyed it, and I'd read another in the series. Recommended. Ex-Navy Penny Summers as a master gardener enrolls in Madison Lerrimore's residential design course in Maryland which leads to a visit with the instructor to one of Olmstead's design's in North Carolina. The author does a masterful job of interlacing fact with fiction and incites interest in visiting civil war sites as well as some of these gorgeous old southern mansions and their gardens. The second in the series could function as a standalone with protagonist Penny and her great-aunt Zelma and Ex-Navy Penny Summers as a master gardener enrolls in Madison Lerrimore's residential design course in Maryland which leads to a visit with the instructor to one of Olmstead's design's in North Carolina. The author does a masterful job of interlacing fact with fiction and incites interest in visiting civil war sites as well as some of these gorgeous old southern mansions and their gardens. The second in the series could function as a standalone with protagonist Penny and her great-aunt Zelma and Navy sweetie, Aaron Hunt. In this narrative, Penny gets to know her teacher on a personal level, including Madison's daughter, Kalea, a precocious eleven-year-old and Madison's partner. The author includes a touch of paranormal with Penny who often hears her "Grandpa Jack" making comments in her ear, and her great-aunt Zelma is said to have "second sight." On a tour of the grounds, Penny stumbles across a docent face down in a creek bed who turns out to be a relative of Madison. The multi-layered plot forks off with absorbing peek into civil war history and Madison's twisted tale. (There is a lot of money in civil war memorabilia.) The description of the gardens is interesting, the civil war history and memorabilia interesting, and the sights and flavors of the south interesting. However, there were times when Kalea appeared to be smarter than the adults, and the growing romance between Penny and Aaron was just annoying unnecessary. The characters are not wholly engaging although the narrative moved at a nice pace and the dialogue was believable.